Casas Rurales Cortijo Cerro Fuentes Nuevas (Castril-Granada) These are three typical and authentic Andalusian farmhouses, really different from other rural houses. Situated in the actual village itself, with a SWIMMING POOL (Aureliano, Rafael and Manuel), and set between two nature reserves, the Parque Natural Sierra Castril, Parque Natural Sierra Cazorla and the Granada plateau, on the border between the provinces of Granada and Jaen, sleeping 2 to 12 people in each, and with a maximum of 40 people between the three of them. It has a spacious lounge with a fireplace for large groups of family or friends. 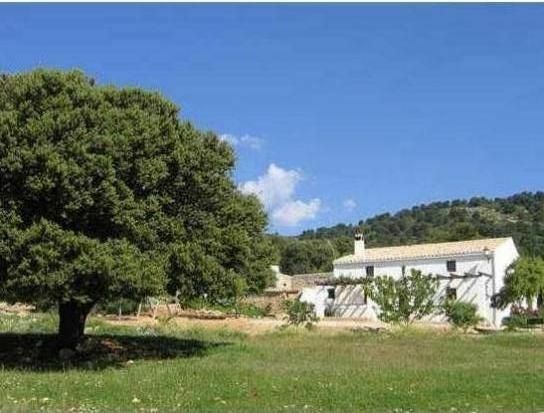 The rural houses are set in a privileged place of unique natural beauty, surrounded by hundred year-old pine trees and Holm oaks, with wide open spaces where you can enjoy the magnificent views that extend over the horizon. It is in fact a healthy place, ideal to spend a few days in the heart of nature. Experience the true pleasure of staying at our accommodations and you will discover nature in its purest state. Our Rural houses Cortijos Cerro Fuentes Nuevas, have received the certificate of an Andalusian Nature Reserve , offering nature tourism, with all the guarantee and tranquillity that our guests deserve when they choose us and discover this authentic rural tourism at first hand. - CORTIJO I AURELIANO (sleeping 2-12) - The true rural tourism, with its typical and traditional Andalusian architecture, is perfectly equipped with all the necessary comforts to ensure a very pleasant stay, without losing all the traditional charm and rural quality. This farmhouse has a special homely and comfortable atmosphere to it, that can be enjoyed by the most select of guests. - Facilities: heating, six bedrooms, three double and three twin, two complete bathrooms, a kitchen equipped with all the necessary utensils. Fridge, coffee machine, toaster, microwave, oven, iron, juicer, TV, DVD. Bed linen and towels. - Outdoors there is a shaded area with vines, a barbecue and a large car park. Swings, swimming pool. - CORTIJO II RAFAEL (sleeping 2-12) - This is a complete rural house, very spacious with lots of natural light, decorated to the finest detail, offering the ideal way of relaxing and not doing without any service. Come to a place that still preserves much of the flavour of years gone by, with all the facilities that a modern-day customer demands. - Facilities: heating, six bedrooms, two double and the other four are twin, two complete bathrooms, a lounge with a log fireplace, a kitchen equipped with all the necessary utensils, fridge, coffee machine, toaster, microwave, oven, iron, juicer, TV, DVD. Bed linen and towels. - Outdoors there is a shaded area with vines, a barbecue and a large car park. Swings, swimming pool. - CORTIJO III MANUEL (sleeping 2-10) - The rural house preserves the majority of its original features and has been carefully looked after to the finest detail, with quality furniture and decorated in a simple and traditional style. Here, you will have the opportunity to totally relax and enjoy the peace and quiet of a natural setting. - Facilities: heating, five bedrooms, one double and the other four are twin, two complete bathrooms, a lounge with a log fireplace, a kitchen equipped with all the necessary utensils, fridge, washing machine, coffee machine, toaster, microwave, oven, iron, juicer, TV, DVD. Bed linen and towels. - Outdoors there is a shaded area with vines, a barbecue and a large car park, swings, swimming pool. - LOUNGE: REFUGIO - This is a spacious lounge, which is ideal for large groups of family or friends, or any other social gathering. It is available to any guests on request. It seats up to 40 people, ideal for groups occupying more than one house. It includes a kitchen with utensils, fridge, log fireplace and oven for large roasts. - SOLARIUM/SWIMMING POOL - Below the threshing floor of the farmhouse we find the swimming pool, in a closed area. Around it there are large shaded areas with pine trees, Holm oaks, red cedars, junipers and aromatic plants such as rosemary, thyme, marjoram, etc. - It also has a terrace area with natural stone, sun loungers, chairs and tables. Here, you will be able to enjoy a relaxing swim, accompanied by singing of the birds. - Electric heating.